My name is Tammy S. and my husband and I are the parents of an active duty Marine in Afghanistan. There are not words to tell you how much we love and appreciate you, the staff, at Anysoldier.com. Our son went over there for the first time in August. We had heard how soldiers needed even the most basic supplies and so expected the requests, from him to start coming. This has not happened in the way that we thought at all. After being there for a month, when we asked, what he needed this is what we were told..."Don't worry, I signed up at Anymarine.com and my buddies and I are constantly recieving boxes from strangers. I have junk food, personal items and everything I need". I want you people to know how much it means to a Mom to hear that so many people care. We are, of course, over the top grateful for everything that is sent to every serviceman, but without your website, your care, in short, YOU, he would not be as well taken care of as he is now. His only request...Shop towels (we had to laugh). So in closing... Thank you so much. You are appreciated. 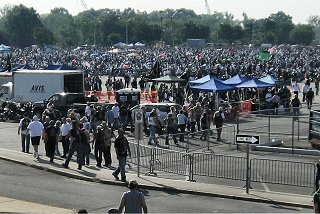 28 Jun 2007: "By establishing an extensive network of U.S. soldiers available to distribute letters and care packages from home, Any Soldier Inc. has taken a leadership role in making sure the men and women of our military receive vital emotional support in their times of greatest need." 23 December: "Supporting our troops"
16 December: "Amazing Kid: Brianna Cart"
13 December: "Interview with Obadiah and Marty on RadioU"
8 December: "Local group 'With Thankful Hearts' sends care packages to soldiers overseas"
8 December: "Boxes going to U.S. troops"
7 December: "Despite economic downturn, Any Soldier project grows"
6 December: "Care about those who soldier on "
3 December: "support our heroes - send a care package!" 26 November: "Action Line: How to send holiday packages to soldiers"
22 November: "Let them know you care"
20 November: "Boxes for Afghanistan"
18 November: "Support U.S. troops; send them letters, packages"
11 November: "Supporting Ohio’s Troops Overseas"
10 November: "Jeff Bridges leads hungry kids campaign with partners Whole Foods, Weight Watchers, Wegmans"
10 November: "Southborough soldier surprises Woodward School student"
6 November: "2010 Veterans Day Virtual Telethon"
4 November: "Woman seeks contributions to send packages"
25 October: "Outskirts Press presents K9 Heroes, Honors the Dogs of War, by Nicole Arbelo"
11 October: "Sunday Cut-a-Thon fundraiser for troops in Afghanistan and Iraq"
1 October: Live interview with "True North Radio"
15 September: "Volunteer has history of helping troops, strays, poor"
14 September: "Glen Cove Kids Donate Items to Soldiers on 9/11"
7 September: "Troop supporters fear apathy for remaining overseas soldiers"
4 September: "The Bizarre, Unsatisfying Things Soldiers Receive in 'Care Packages'"
The Atlantic - Washington D.C.
3 September: "Melbourne resident hopes to send 100 care packages to troops overseas"
19 August: "One Soldiers Simple Request Can Bring Joy to an Entire Platoon"
12 August: "Flag bridges generations of veterans"
9 August: "Elvis Rocks Mesquite"
4 August: "Elvis Sock Hop to Benefit Any Soldier Project"
3 August: "Eagle River business gets meals to families of C-17 crash victims~ Elmendorf AFB"
9 July: "Seniors donate packages to servicemen"
4 July: "Freedom isn't free - ask a soldier"
15 June: "The Big Help"
9 June: "Navy Veterans charity lifts service members' thank-you letters from other organizations"
St. Petersburg Times - FL. 2 June: "Student awarded for supporting troops"
16 May: "Letters From Home"
8 May: "Support Our Troops!" 3 May: "Ping Pong Table for Camp Patriot"
"Hello! I work in Yahoo! for Good, Yahoo! 's Corporate Social Responsibility team. We are big fans of your site and appreciate all you do for our troops. 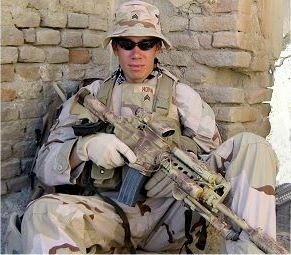 In honor of Memorial Day, we are looking for inspiring stories about what people are doing to support the armed forces. 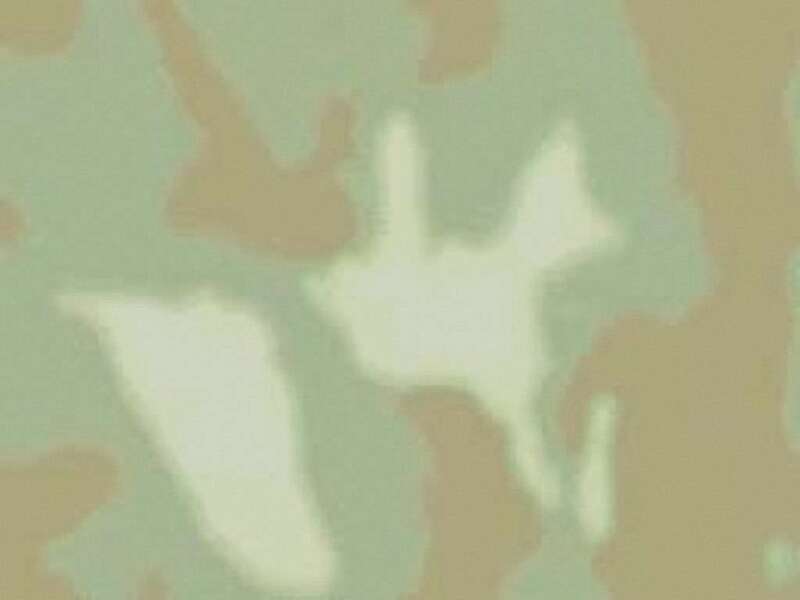 We posted a blog at http://shine.yahoo.com/channel/life/ping-pong-table-for-camp-patriot-1388784/ to look for these types of stories. 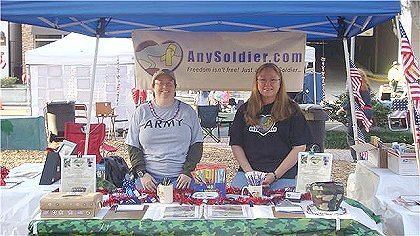 As you can see, we've listed AnySoldier.com at the top of ways to help. We would really appreciate if you can comment on this blog with your story and forward this post to folks who may have amazing stories to share. The hope is that we'll find a story that is compelling enough to feature on Yahoo.com and shine an additional light on the cause. 1 May: "Trinity mails to troops, Care packages are to be sent to military troops in Afghanistan"
1 May: "Pasadena woman ships care packages to U.S. troops in Iraq, Afghanistan"
Pasadena Star-News - Pasadena, CA. 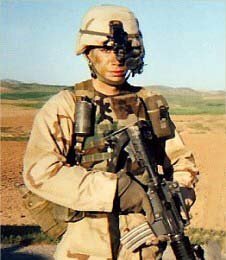 28 April: "Valley woman finds unique way to connect with Marine in Afghanistan"
6 April: "Military Support Organization Assessment Project (MilSOAP) rates Any Soldier Inc."
*30 March: "a letter of encouragement..."
10 March: "Boy Scouts popcorn delivered to Marine bases across the US"
3 March: "NSDAR Project Patriot"
21 February: "Brownie troop sends toys to Afghanistan"
Will Benefit The Sister Soldier Project"
11 February: "Despite illness, teen finds a way to help others"
1 February: "Son of Singing Preacher-man Finds Time to Rhyme"
28 January: "Greater Frederick Advertising Federation Hosting Logo Trends Event ..."
20 January: "Securities America Ends 25th Year With a Bang"
14 January: "American Legion Post No. 29 can help get care packages to Jackson-area soldiers"
7 January: "How to send a soldier homemade cookies"
4 January: "VIDEO: Mid-Michigan's best news photos of 2009"
1 January: "Martha Stewart: Ask Martha Send cookies with long shelf life to troops"
To raise the money and awareness Raytheon held raffles (Take a Chance on Any Branch) and Scoops for Troops (make your own sundaes) and some did Any Pizza (buy a slice to support the troops). 13 different Raytheon centers were involved (East coast, West cost and in between) and raised $7,200.00. 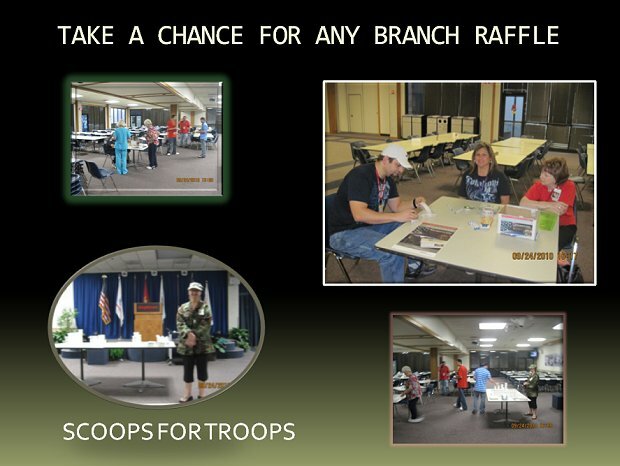 Donation boxes are set up in each center and employees donate goods to send to the warfighters. 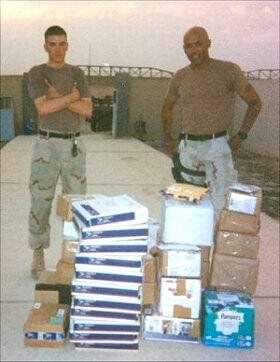 They shipped out over 2,100 pounds of goods, touching about 1,000 warfighters. To all the wonderful people at Any Solider.com, Thank you for all your help with our BBQ and supply drive at the Showboat Pub in Camas, WA. On June 19th we raised over $400.00 and collected enough supplies to put together over 30 care packages. It was so successful that we plan to do it once a month. The next drive will be July 31st starting at 4:00. Also thanks to the owners of the Showboat Pub and all the people that gave money and supplies. 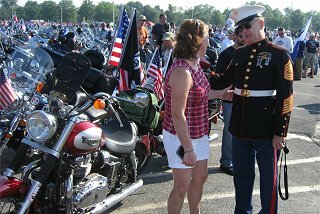 Pictures taken by Supporter Danielle S.
Ride organizer Christina Webster said, "This was truly a labor of love, and so many came together to make this ride a way to show how much we love and support our warriors. Thank you to all who made this such a beautiful day." A special thank you to the Horn family who made the day extra special witheir presence and to Pam Tajak AnySoldier.com supporter who had the "traveling bake sale" to raise proceeds. 2nd annual We Love Our Troops Charity Poker Ride June 11, 2011. It is an annual event that draws close to 200,000 people to watch a parade, run in a 5K race, and spend time and money in a Jubilee in the Park. Joni (Scotty on the forum) and I (Heidi Edgar) were set up in the Not-for-Profit area of the Jubilee again this year. We estimate that we personally talked to 600 people, and had about 350 note cards signed! These note cards are being distributed to our groups as well as one of the forum card swaps.